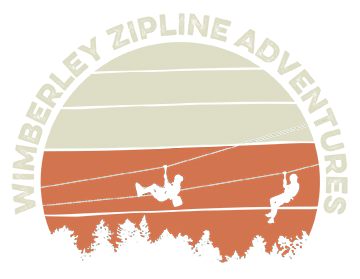 Tours are $92.38 (Plus 8.25% Sales Tax — Total $100.00) per person, which includes parking, equipment, training, guided walking tour, bottled water, and of course ALL 10 LINES of the Zipline Adventure. Advanced reservations are required for every tour. 5 Tours* a Day, Advanced reservations are required for all tours; call or email to check availability and make reservations. (This deposit is not an extra charge; it's only half down up front to secure your tour.) Do not Pay until you call or email to reserve a tour time! Do not Pay until you call or email to reserve a tour time! American Express - We do not accept American Express. If you wish to use your American Express card, please use PayPal and pay the full amount. We use PayPal at www.PayPal.com to process our online transactions. The security of your information, transactions, and money is the core of PayPal's business and a top priority. PayPal automatically encrypts your confidential information in transit from your computer to PayPal's using the Secure Sockets Layer protocol (SSL) with an encryption key length of 128-bits (the highest level commercially available). Before you even register or log in to PayPal's site, PayPal's server checks that you're using an approved browser - one that uses SSL 3.0 or higher. Once your information reaches PayPal, it resides on a server that is heavily guarded both physically and electronically. PayPal's servers sit behind an electronic firewall and are not directly connected to the Internet, so your private information is available only to authorized computers. You do not need an account through PayPal to send a payment. If you are new to PayPal you will simply go through an alternate checkout, and will have the option to sign up with PayPal afterwards. If you have a PayPal account, you will log in when prompted to complete your online transaction. Refunds will be given for cancellations due to bad weather only. This is an appointment only business. No refunds are given for missed appointments. When you book your tour we schedule guides and other staff for your trip. If we have no-shows, we still incur staffing expenses.